Institutet för nerväxtstudier (Institute for degrowth studies) is an organisation consisting of scholars, students and activists, which aims to promote and advance degrowth debates in the Nordic countries and internationally. The group stems from the 2015-16 multidisciplinary research theme on degrowth at the Pufendorf Institute for Advanced Studies (Lund University), and took shape during the organisation of the 6th International Degrowth Conference for Ecological Sustainability and Social Equity in Malmö. We are in close contact with degrowth groups internationally. 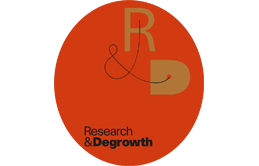 Some of our members are also part of the Support Group of International Degrowth Conferences. We are a very international group, coming from at least 14 different places across the globe and having got together here in Sweden. We are continuing our activities in Lund and Malmö. Every month we will be organising public events – degrowth cafes, lectures, workshops etc – on degrowth and related issues. Interested in collaboration or want to get involved? We are open to event and other collaborative proposals, so do get in touch with ideas if interested. As a group we meet every first Wednesday of each month, alternating between Lund and Malmö. Everyone is welcome to join these also.